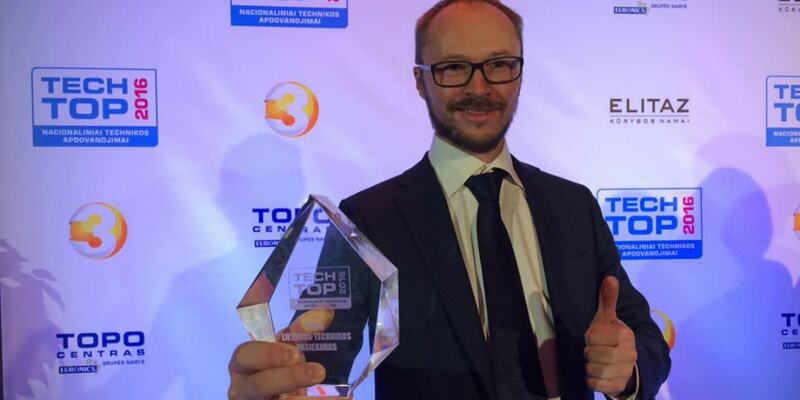 On 12th November, our CTO Donatas Malinauskas was at the gala ceremony for this year’s Tech Top awards to pick up Deeper’s award for Lithuanian Technical Achievement of the Year. The Tech Top awards are an annual contest held in Lithuania each year to find the nation’s favourite gadgets and innovations. Over 400,000 people cast their votes in this year’s competition. Tech Top is organised by JSC Kūrybos sodas, along with partners TOPO Group and TV3 Television. Deeper’s CEO, Aurelijus Liubinas, believes the hard work of the whole team at Deeper is what enables the company to keep on innovating. “I would like to thank the team at Deeper, and say how honoured we are to receive this prestigious national award. We fully intend to keep on innovating, with brand new products and updates in the pipeline,” he commented. This has been a bumper year for Deeper in terms of international Awards. We have picked up prestigious awards at top fishing industry events (Best New Accessory at Efftex, Best Electronic Device at China Fish, the John Dunphy Award for Innovation at AFTA) plus numerous national awards for our innovative approach to business (a Best Internet award for marketing, an Innovation Solutions Leader award from the Ministry of Economy). And, of course, it all started at CES 2016, the biggest consumer electronics trade show in the world, where Deeper was named best innovation in the Wireless Handset Accessories category. We’ll be back at CES this January with a brand new product, along with showcasing our Smart Sonar range.